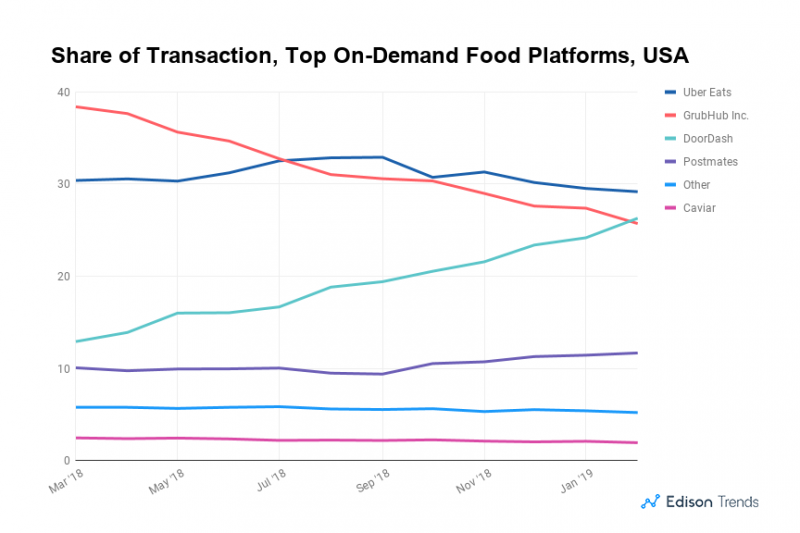 DoorDash has now edged ahead of Grubhub with 38 percent of the U.S. restaurant delivery market, according to revised data from last year’s Edison Trends market share report, which was updated. 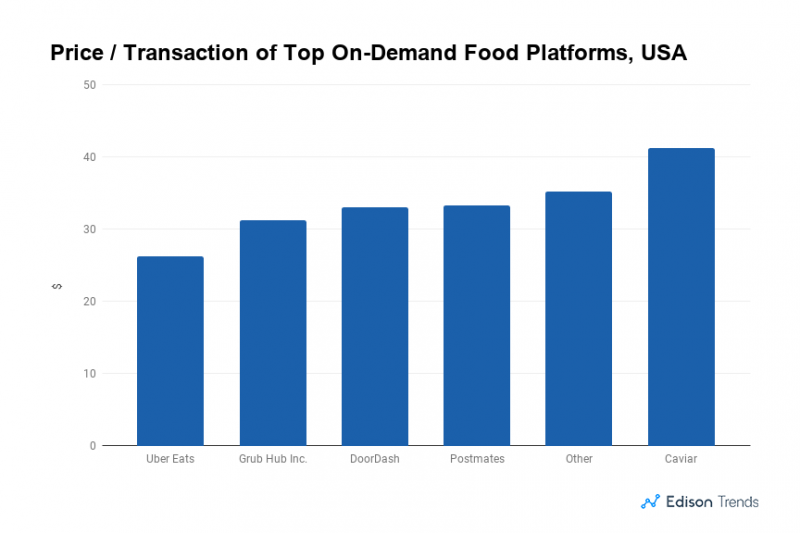 Grubhub is now second, at 27 percent; with UberEats in third at 25. Postmates is the next-closest delivery provider, with 12.1 percent of the U.S. market, followed by Caviar at 2.7 percent. From there, it’s the “other” category that includes smaller, regional players at a combined 5.9 percent of the market. 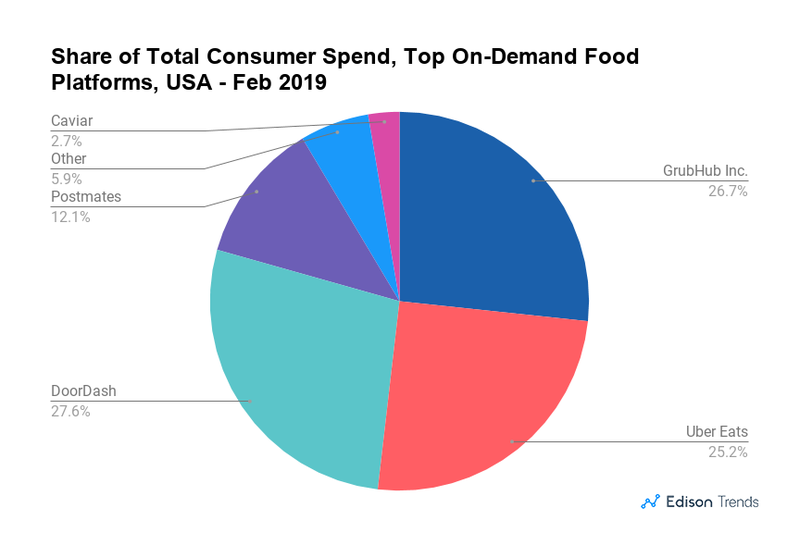 Another findings in the report is that DoorDash’s monthly share of total consumer spend in the U.S. nearly doubled from 15 to 28 percent from March 2018 to February 2019. In comparison, monthly share of total consumer spend at UberEats, Postmates and Caviar remained roughly the same. Grubhub, however, saw an 11-percentage-point loss in share during this period, falling from 38 to 27 percent. Data over the last year shows that DoorDash has gained significantly as both Grubhub and UberEats gave up share to the new category leader. The remaining providers in the survey, including the aggregate “other” category have seen their slice of the market remain steady. Edison’s report also includes price per transaction for the leading providers, led by Caviar that has seen an average price per transaction above $40. Other providers, grouped together, came in second near $35, with Postmates and DoorDash both nearly tied at just over $30 per transaction. UberEats has the lowest price per transaction, near $27. The data is based on a sample of anonymous and aggregated e-receipts from millions of delivery consumers in the United States. More information from the report is available at https://trends.edison.tech/.